These pretty cutout have translucent candy windows that look like stained glass. Because the candy will stick, line sheets with nonstick silicone baking pan liners or cooking parchment (step 1). You can store the cookies airtight for up to 1 week. Prepare dough for Favorite Cutout Cookies. In step 2, roll dough 1/4 inch thick. Cut cookies into desired shapes and place on silicone- or cooking parchment-lined baking sheets (see notes). 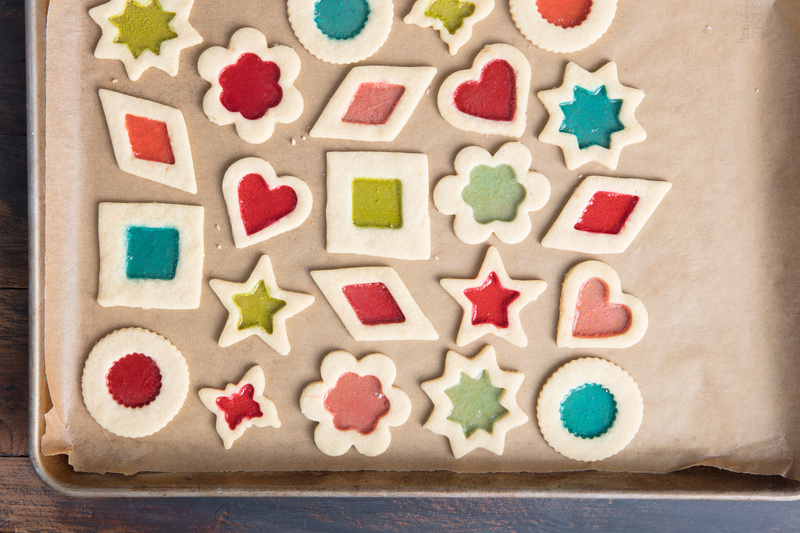 Use smaller floured cutters or a small, sharp knife to cut out and lift a design from the center of each cookie (such as a small star from the center of a larger star or a round), leaving at least a 1/2-inch border around cutouts. Chop transparent, colored hard candies into 1/4-inch pieces. Fill cutout portions of dough just to the rim with candy; use one color in each cutout. Bake in a 300° oven until cookies are golden and candy is melted, 15 to 18 minutes. Let cookies cool on sheets until candy is firm. Slide a thin spatula under cookies to release and transfer to racks to cool completely.